Calcium hydroxide, traditionally called slaked lime, is an inorganic compound with the chemical formula Ca(OH)2. It is a colorless crystal or white powder and is obtained when calcium oxide (called lime or quicklime) is mixed, or “slaked” with water. It has many names including hydrated lime, builders’ lime, slack lime, Choona, cal, pickling lime or Noora powder. Calcium hydroxide is used in many applications, including food preparation. Limewater is the common name for a saturated solution of calcium hydroxide. 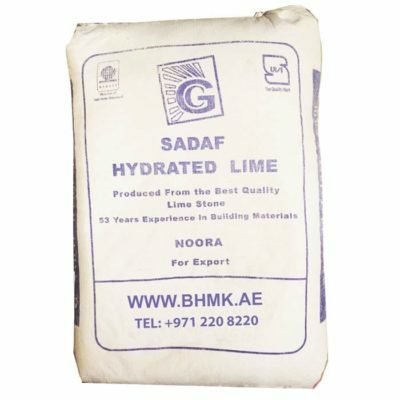 Our range of hydrated lime is manufactured in the region and thus ensures the best prices along with the highest quality. Our brand have been in the market for more than a decade. Supplying Lime powder or Noora to various small and large scale projects in Dubai, Sharjah and across other emirates in UAE as well as other GCC regions such as Oman & Kuweit. For information regarding the product specifications, please do not hesitate to contact us. The product can also be loaded into 20ft containers for export. The FCL amount is 1250 Bags equivalent to 25 tonnes.